Bride and groom waltzing to "Irish Eyes"
Friday night Eddie and I performed at a wedding in Municipal Park in Boise. After a miserable Thursday (in weather and more), Friday evening, down by the river and under the huge cottonwood trees, was perfect: not too warm, not too cool, very gentle breeze. Lovely. The bride and groom met with me about a week before the wedding to pick out music and discuss what they wanted and how the bagpipes would fit into their plans. I really enjoyed meeting and talking with them in the Piping Centre and getting to know them a little bit, which is much nicer than just showing up at a gig, playing, and going home. They both looked beautiful and incredibly happy and peaceful. We marched the bride and her entourage in playing Lord Lovat’s Lament and Murdo’s Wedding. The ceremony was refreshingly brief, with the bride and groom reading vows they composed themselves. After the officiate announced their marriage, we played Highland Cathedral (I played the harmony part). Then we marched the entire contingent back to the celebration area, played “Irish Eyes” for the bride and groom to dance to, and then a few more tunes before leaving them to their guests and – I hope – a wonderful, long life together. 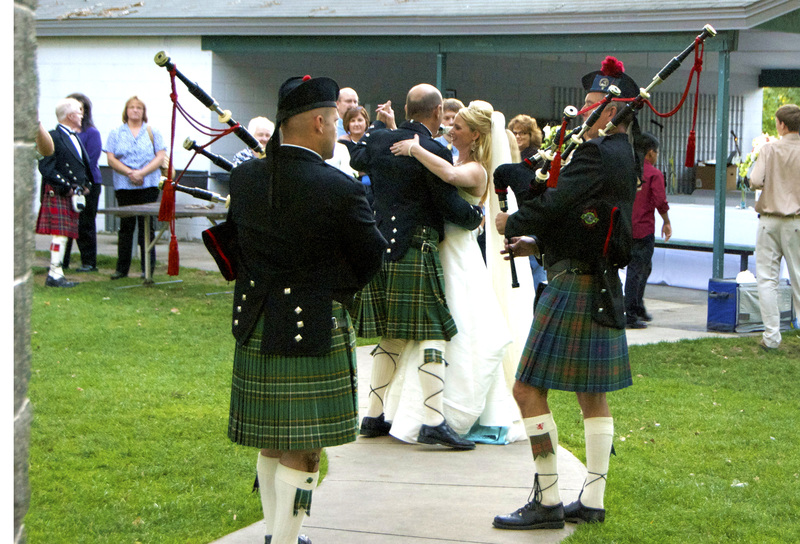 This entry was posted on Sunday, September 12th, 2010 at 8:03 pm	and tagged with bagpipe wedding and posted in Performances. You can follow any responses to this entry through the RSS 2.0 feed.